This e.l.f. Contouring Brush is specifically designed for advanced makeup application to help achieve professional looks. The densely packed hair and structured shape achieves flawless dimension along the cheekbones, forehead, and jawline for targeted contouring. Perfect for using with pressed or loose bronzer powder, liquids, and creams to create beautiful sculpting all over the face. This brush is made by artisans with expert craftsmanship to cut, shape, and hand-assemble the ultra-fine synthetic hair for a luxurious experience. How To Use: Apply colour on the sides of the brush for a natural blend of colour or use the top of the brush for fuller coverage. Blending using back and forth motions to blur harsh lines for a flawless complexion. The brush is ok for packing product on but not for blending. 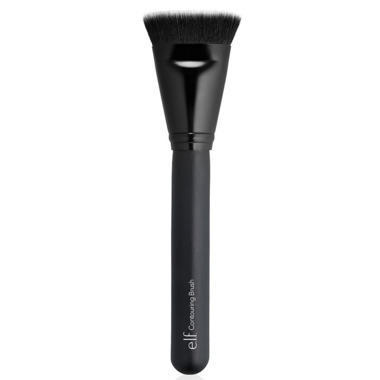 Fantastic contouring brush for an amazing price! Highly recommended. E.L.F. brushes are always so surprisingly soft. This brush has just enough stiffness to maintain its shape. Great for contour. This brush works super well and is very soft! For the cost, you can't go wrong. Stll practising the contouring technique, but this brush is accomplishing splendid results and the quality is excellent for the money. I love all of the ELF products I've bought from Well.ca. Thank You. Soft and dense, very comfortable to work with, can easily create sharp counturing and blended out one! Can't believe how inexpensive this brush is. it's great quality and is amazing for contouring! This brush does exactly what it's supposed to do and at an affordable price. Does a great job whil contouring. Makes blending and powdering easy. A great deal. This brush is just right. Very soft and very reasonably priced! It's a little stiff but if you want a sharp contour there is no better way to get one than this. Really good brush. Brush is thick and the bristles are soft. The price here is cheaper than other retailers! Bonus!! Great contour brush. Soft bristles that dont shed even when I washed the brush. Recommend! This brush made it easy to apply blusher precisely. Nice to use as contour brush as well, so it's like 2 in 1 brush. This brush is super soft and really great for blending out cream contour. This contour brush is excellent, especially for the price! Very soft dense bristles, blends really well. I only gave it 4 stars because it's JUST a smidge wide for my small features but I'd buy it again for sure! As with most elf products, this brush is really good quality for the price. However, I usually use a matte powder bronzer to contour and found this brush to create too harsh a line that is difficult to blend out. I think this would be perfect if you are doing a cream contour or want VERY defined features!! Great brush for contouring, very dense and not too big. Can't go wrong for the price! Bought for granddaughter and she loves it. Prices are great shipping fast . WIll order again. I like this brush. Very dense bristles which creates sharp and accurate lines. Very nice brush. Perfect size. This Is By Far The BEST Contour Brush I've Every Used. It's The Perfect Size To Contour Your Whole Face Including Down The Side's Of Your Nose. Great Product & Fantastic Valve.